I am very aware I didn’t make July’s #sewmystyle challenge. I just really didn’t like that blouse very much and I couldn’t think of a way to hack it to suit me. What can I say? Patterns don’t always work for everyone. So I’m moving straight on to August! 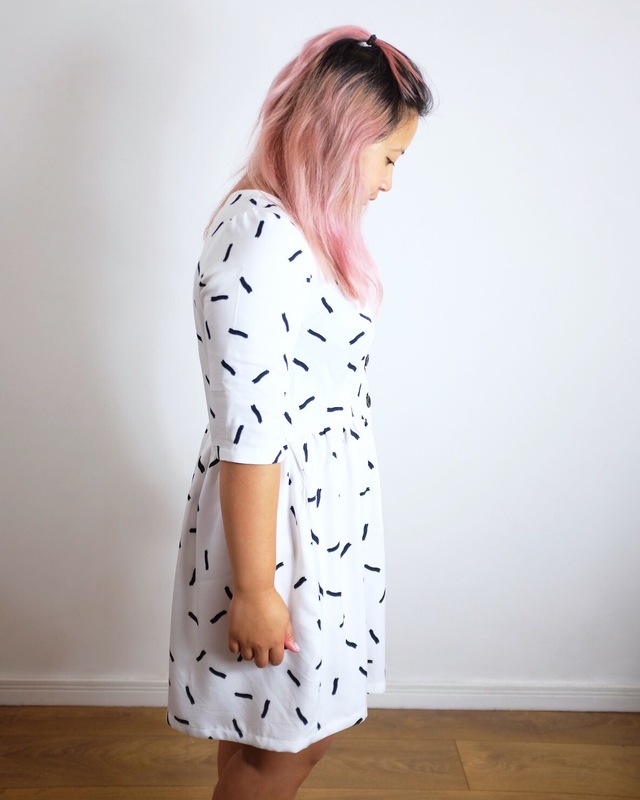 This month is all about the Darling Ranges dress from Megan Nielsen! The Darling Ranges pattern comes in 3 versions – a dress with waist darts and a gathered skirt, a dartless blouse and a dartless dress. All of them come with the same button front and three quarter sleeves. It’s a simple relaxed look for those casual days out and a great alternative to the traditional shirt dress. 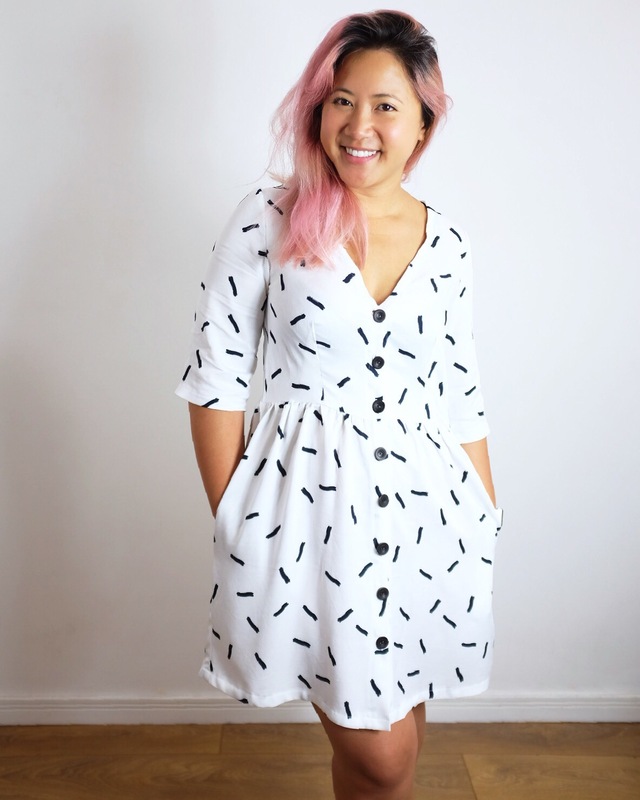 #Sewmystyle founder Alex of Bluebird Fabrics asked me to do the tips and tricks for this month’s sewalong and here they are! This dress needs a woven fabric. A light to medium weight is best, which means pretty much anything will work. Chambrays, linens, cotton poplins and lawns would be great choices for beginners as these are pretty firm and easy to handle. Those of you who are feeling a bit more adventurous might want to try a silk or crepe de chine. I made mine with a viscose twill from Stoff & Stil. It’s got a lovely soft drape to it which worked really nicely. If you’ve used a very lightweight fabric it may be worth interfacing your button plackets to make it more stable for the buttons and buttonholes. The pattern is quite relaxed in fit so as long as you make sure you’ve picked the right size for yourself on the bust/waist, you’ll be unlikely to run into trouble. I find the sizing is more spaced out with Megan Nielsen patterns as they tend to cover a large size range with fewer ‘steps’ between them. I made a Small but I probably should have made a Medium and taken it in instead. I’d definitely recommend going up a size if you’re in between sizes, especially on the bust. I made version 1 – the one with the waist darts and gathered skirt. I found the waist darts went up too high on my bust and I lowered them by 2.5cm and could probably have gotten away with lowering them further. I also shortened my skirt pattern by 10cm and used a 4cm hem and it’s still a decent length on me (bear in mind I’m quite petite at only 5’2). A regular sewing machine is all you’ll need to sew this one up! It’s a lot of straight seams and mostly straight forward to sew up. I’ll be honest, I struggled a little easing the sleeves into the bodice of this dress. I ended up making little gathers to take out the excess and made it into a design feature! It’s not really that noticeable though! The rest of the dress I thought came together quite easily and if you’re making the dartless version, it’ll be even easier and quicker to do! This is a great time to get out those buttonhole feet and practice folks! 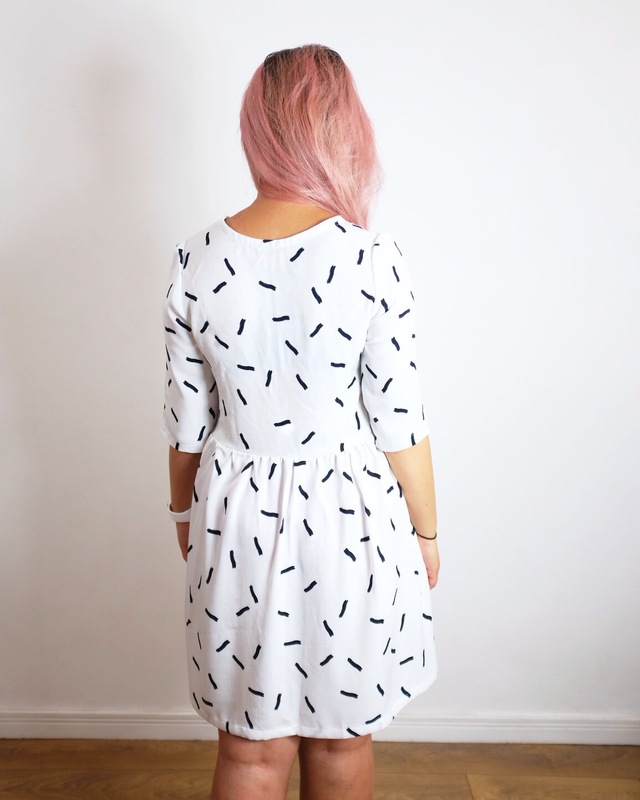 Your dress/ tunic/ blouse will need a few buttons up the front and the easiest way to do that is with a buttonhole foot in your sewing machine (if your machine is capable that is). Alternatively you can hand stitch them in to get a really beautiful finish on them. This has been a fun make! I’ll be looking out for what you guys do with this pattern. I think there’s lots of scope for altering it to suit your style! I’m a huge Megan Nielsen fan! I have several of her patterns but not this one. The gathering at the waist is disastrous for me – gathering anywhere except maybe at the shoulders or neck 🙂 But I think this dress is lovely on you and is a great fit! I fall in love with absolutely everything you make, Emily! Your style is so elegant. This dress fits so well, it’s beautiful. I wasn’t too keen on this pattern but I have to say your version is lovely and I’m having second thoughts about going for it after all! It’s also so useful to have the advice really early in the month.